When it comes time to replace your home’s roof, you want quality, durability and curb appeal that lasts for years to come. Of all the investments you can make in your home, few have greater benefits than a quality roof. Not only do roofs protect you from the outside elements, but they add a sense of beauty and durability to your property, raising its value and improving its curb appeal. Constitution Contracting offers all of these benefits and more in homes throughout Lowell, MA and the surrounding areas. We provide our residential customers with roof repairs, inspections and installation services that are guaranteed to give your home beauty and protection for decades to come. As metal roofing specialists with over three decades of experience, Constitution Contracting knows how to tell the difference between a compromised roof and a damaged, but salvageable one. When you request our assistance for a roofing problem, our team will examine the top of your home in detail, looking for leaks, corrosion, loose seams and any other problems that might make your roof less beautiful or effective. Once we have identified the source and scope of the problem, we will determine whether your roof can be fixed or needs to be replaced. If it’s a repair, we will restore your roof to its full beauty and strength; if you’re in need of a new roof, we will quickly install a new, custom roof that is just as beautiful and even more effective. When we repair or install a new roof in any home, our team is known to effectively maximize both beauty and durability. Our goal is to not only keep your home safe from the outside elements, but also to provide financial, long-term benefits. 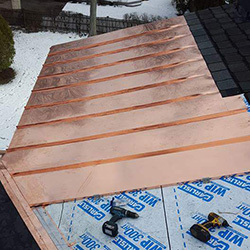 By choosing a custom metal, copper or cedar roof, you’re already adding value to your home, reducing the frequency of roof problems and lowering your repair and maintenance bills! 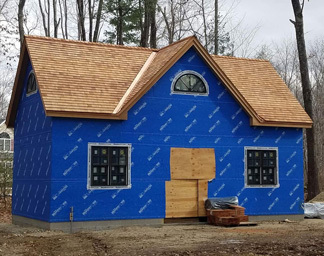 Any materials we use are custom to your roof and are cut and bent on-site ensuring you’re getting the best roof for your budget. 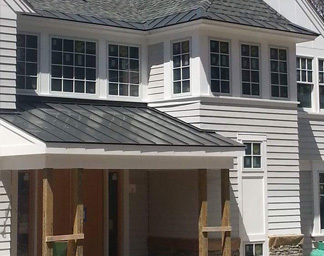 For more information on quality roofing services for your home, contact the team at Constitution Construction today!